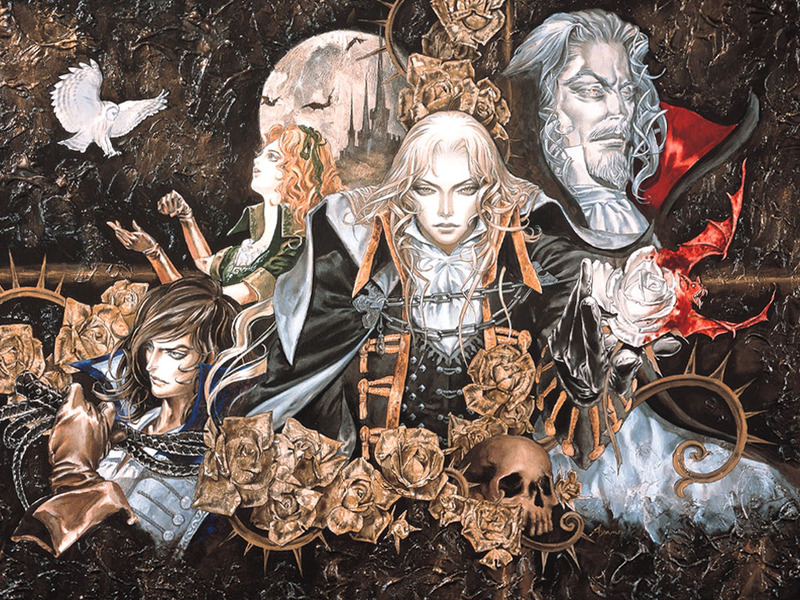 Corny voice acting aside; ‘Castlevania: Symphony of the Night’ is to me an absolute masterpiece in gaming. From the smooth controls to the masterfully done soundtrack, there are many reasons why I still love Symphony of the Night to this day. 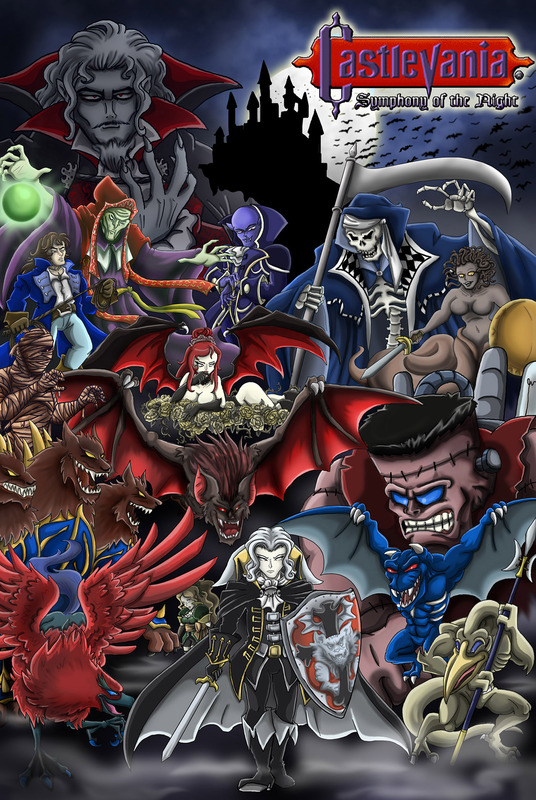 This tribute should sum up why Symphony of the Night is a horror and monster fan’s dream come true in gaming. To this day; I have found I’m not the only one who has been greatly influenced by this game. Game companies and independent game designers alike have borrowed heavily from its pallet; in a newly dubbed style of gaming known as ‘Metroidvania.’ Though ‘Super Metroid’ introduced it and ‘Symphony of the Night’ borrowed heavily from it; it was ‘Symphony of the Night’ that influenced people the most in terms of its intricate level design, amazing character sprites, and atmospheric soundtrack. The main focus of this tribute was the main protagonist Alucard; whose prior exploits in ‘Castlevania III: Dracula’s Curse’ pale in comparison to his outing in the game. Alucard is all around awesome; being able to slash, burn and even punch his enemies into submission. This tribute shows his icy cool demeanor as he walks undauntedly forward. Surrounding him are some of the bosses from the game. Sadly not all of them could be on here due to lack of space. Such bosses from this game’s enormous roster that ended up on the cutting room floor were the Lesser Demon, Doppelganger, Werewolf and Minotaur (the most regrettable), Karasuman, Scylla, Granfalloon, Fake Grant/Sypha/Trevor, Beelzebub and Galamoth. Those that were included were there for specific reasons. Among them are the ones integral to the game’s plot and progress. These included the former hero Richter Belmont, being controlled by the dark priest Shaft seen hovering behind him. The other being the sultry Succubus looking down at Alucard; and above her Count Olrox (the only other vampire in this game other than Dracula.) And of course there is Death; who cheated you in the beginning by stealing your weapons. (But you more than paid him back for that later.) Dracula himself is seen in the BG with his faded visage behind the Castle itself. Other bosses included were those essential to recovering Dracula’s remains and also acting as tributes to the Bosses from the very first Castlevania game: The Giant Bat, The Gorgon Medusa, The Mummy Akomodan II, The Frankenstein Monster and once again Death himself. Other creatures like Slogra and Gaibon, Hippogryph and Cerberus round out the rest of the creature feature here. The last detail that I should note is Maria Renard’s inclusion. Hers is the most miniscule. She is is seen faded behind Alucard. This is because I wanted this tribute to focus heavily on those opposing Alucard. He is walking forward paying no heed to his secret admirer from the back. Luckily if you get the good ending; there is a heavy indicator that Alucard and Maria do live happily ever after. And after playing the game in its entirety; I lived happily ever after knowing it exists and provided me with one of the best gaming experiences ever!